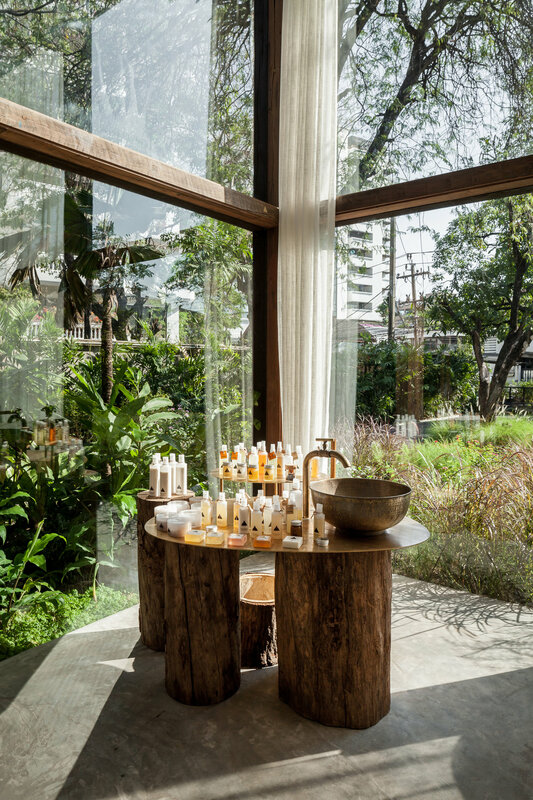 Tucked away in Thonglor’s prime residential neighbourhood, the newly constructed building serves as a shop/showroom for Patom body care products, a small 25-seat café and a place for raising ecological awareness and sustainable living through a series of workshops and farmers market held in the garden, selling fresh produce from the local network of organic farmers. 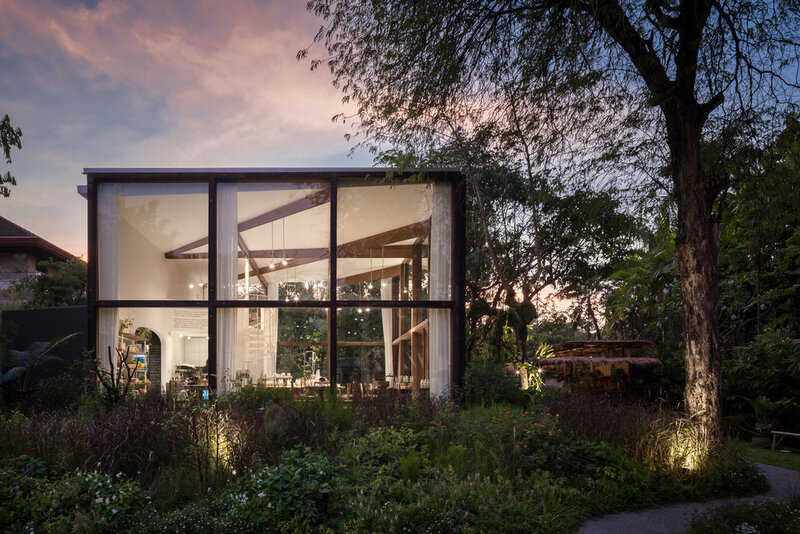 The small wood-framed glass building sits on a slightly raised mound covered by wild grass and ferns that naturally soften its rectangular footprint while carefully preserving an existing line of fruit trees. 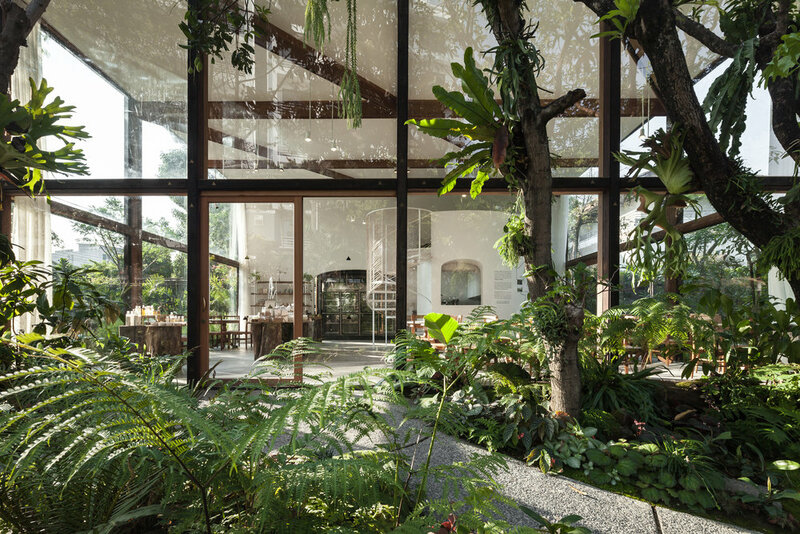 The building's transparency and its modest size set out to unveil the expanse of the lush garden around and beyond its volume, which in turn create a setting where passersby can catch a clear glimpse of the livelihood inside the glass enclosure alongside the garden’s natural surroundings. 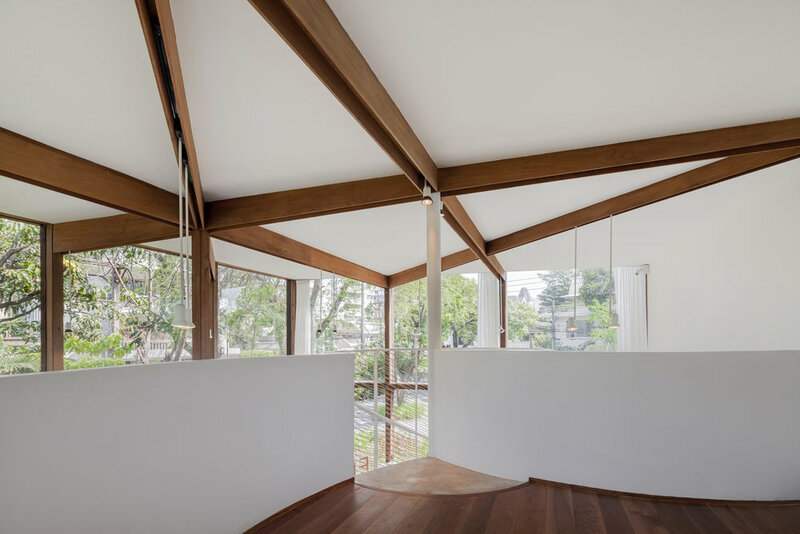 The use of curvature in the design facilitates both the physical and the visual flow of the rectangular enclosure and conceptually reconnects the interior design language with its landscape. 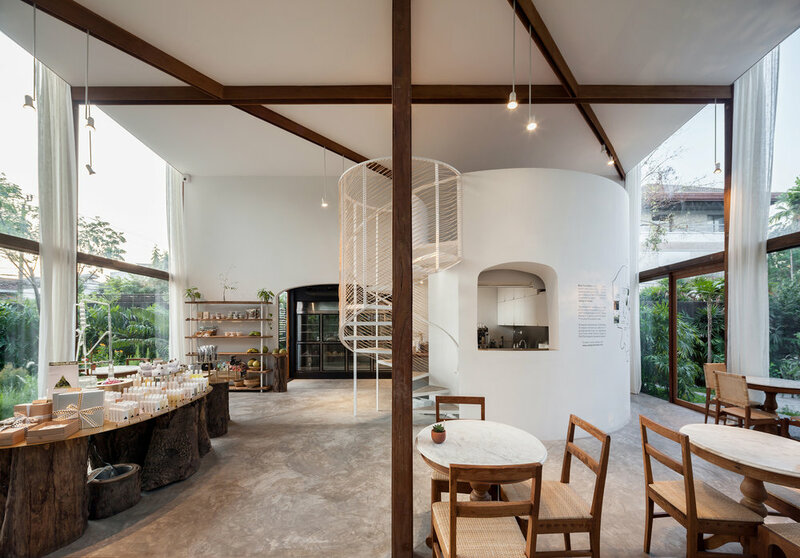 The rattan wrapped spiral staircase and the corresponding curved mezzanine add to the overall interior, an elevated getaway with a privileged view, a hint of intimacy and playfulness. 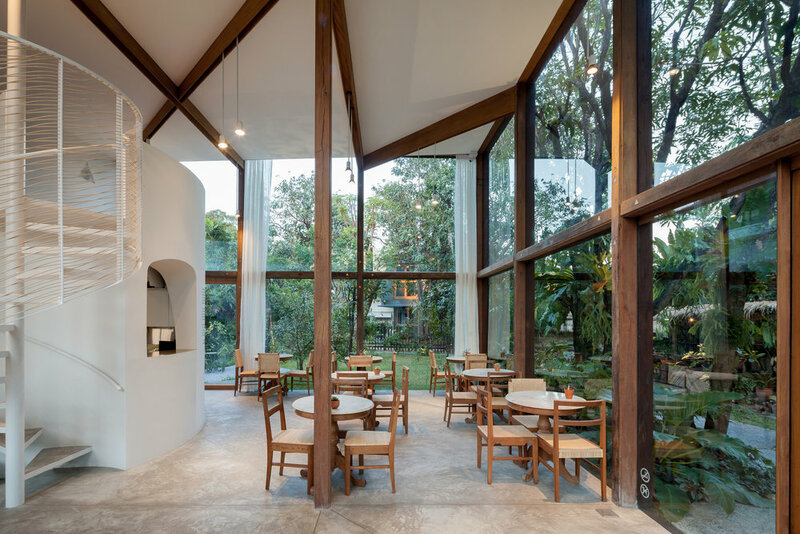 The composition of wood posts and ceiling pattern owe its visual reference to the scenic view of coconut trees and palm trees at Patom’s Organic farm where their tall slender trunks with branches that radiate around the trees’ zenith form an inspiring gesture which initiates the design of the ceiling’s structural layout and the central wood post of the building. 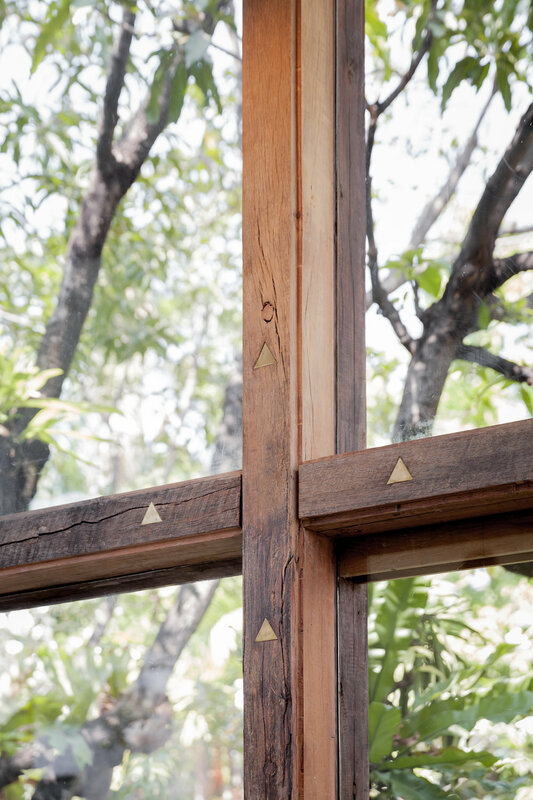 With high regard for wood as a renewable and sustainable building material, all structural posts and beams are consciously made of reclaimed Redwood and Tabak wood recovered from the owner's old and abandoned houseboat. Tree trunks that form the base of the brass display tables were collected from fallen trees at the owner’s farm. 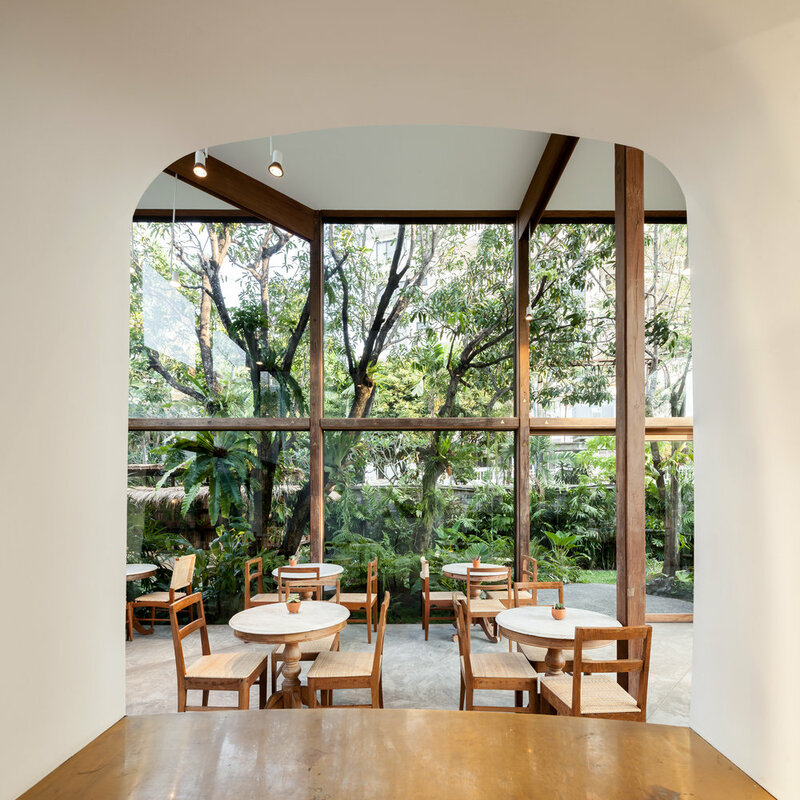 Café tables and chairs were refurbished from the owner’s unused teak furniture collection. 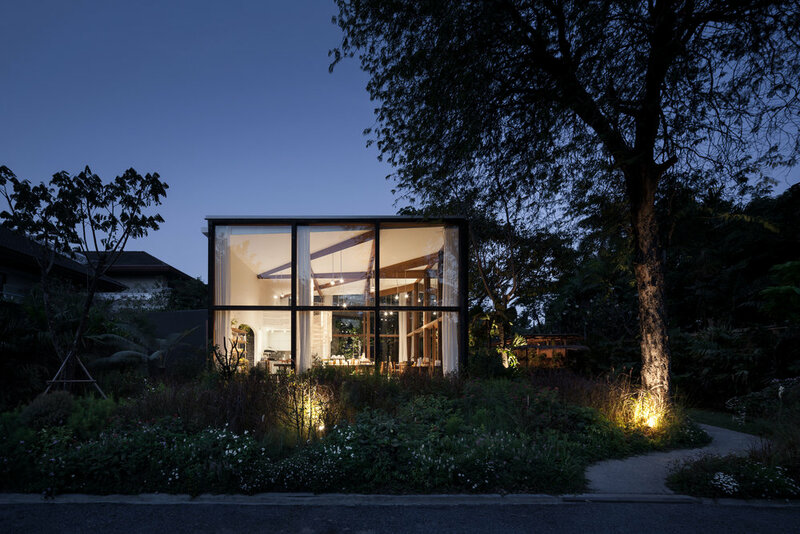 An organic and modern approach in balancing the natural and the constructed environment.